On Wednesday, thousands of students from across the country took part in the ‘Cops off Campus’ demonstration in London, to protest against heavy police presence on campuses, and the brutal way in which police broke up a peaceful protest at the University of London last week. “Today’s eviction was one of the nastiest, most brutal I’ve seen on a campus for a long time,” tweeted ULU President Michael Chessum, about the police action on December 4, which led to 41 arrests. “I’ve seen people having their teeth punched out. The police were not turning up with horses and batons they were just swinging punches,” he added. And it seems the police acted with impunity: earlier this week we learnt that a policeman who was filmed punching a student will not be disciplined. The crackdown on student protesters and the victimization of those who organize demonstrations is well under way. Michael Chessum himself had been arrested in November, a day after another demonstration he had organized took place. The University of London meanwhile has obtained a court order to ban ‘occupational protests’ for the next six months. We have also learnt recently that police tried to launch a secret operation to spy on the political activities of students at Cambridge University. What on earth is Britain coming to? Just imagine if these events had happened in Venezuela, Belarus or Ukraine, or in any other country where the West’s political and financial elites desire ‘regime change’. We’d have had widespread media coverage and comment pieces from ‘liberal interventionists’ and neocon columnists, pledging their solidarity with the students, denouncing police actions and calling for sanctions to be imposed on the country, (or strengthened if they had already been applied). But when student protests are aggressively suppressed in Britain, when basic democratic rights are infringed before our very eyes, it’s a different story altogether. The sad fact is that protesting about anything in Britain today puts you in danger of arrest. Liberties which we’ve enjoyed for hundreds of years are gradually being eroded. It would be an exaggeration to say that Britain is already a police state, but we certainly appear to be heading in that direction. I myself was threatened with arrest outside a railway station a few months ago for the ‘crime’ of peacefully handing out anti-privatization leaflets from the Campaign For Public Ownership. Police patrolling the station went in to inform the private rail company which runs services there to inform them of my activity. I was told that unless I left the station area, I would be arrested, even though I was handing out the leaflets on land which was publicly owned and not owned by the railway company. 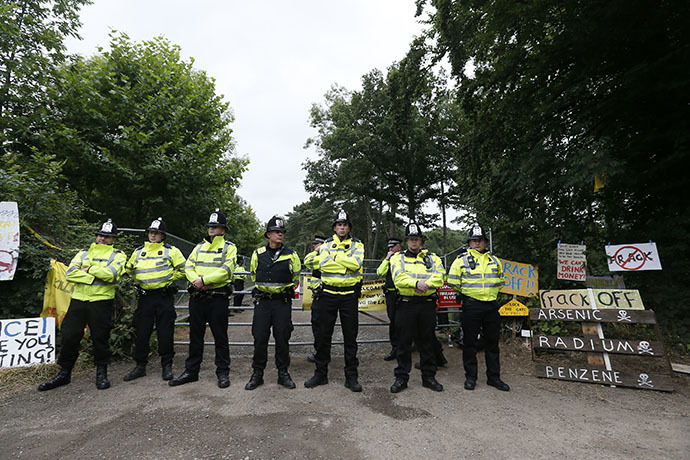 In August, the Green MP, Caroline Lucas and her son, were among those arrested at an anti-fracking protest in West Sussex. “This is an outrageously aggressive response to a day of principled civil disobedience,” protester Ewa Jasiewicz told the BBC. The coverage of the protests in Britain was highly unsympathetic, but if they’d been protesting in Venezuela against government policy and been similarly treated, I’m sure they would have been accorded hero status. The background to the current student protests is the privatization of state education in Britain. The neoliberal coalition government is on a mission: to destroy state provision but Britain’s students are fighting back against the commodification of education. Students at the University of London, showing admirable solidarity, have been campaigning for the rights of the university’s lowly paid outsourced staff. These staff would have been employed directly by the university in the past, but since their jobs were outsourced, they have seen their employment conditions worsen. At the University of Sussex, students have been campaigning against privatization for over a year. In April, a peaceful occupation was ended when police turned up on campus with riot vans and dogs. Michael Segalov, part of the ‘Sussex Against Privatization Campaign’, revealed this week that he was one of five students who were being suspended by the university authorities. “We have not been charged with any crime or told of the specific reasons for our suspension. I believe we have been targeted for suspension, to intimidate the growing campus movement against privatization,” he wrote in The Guardian. 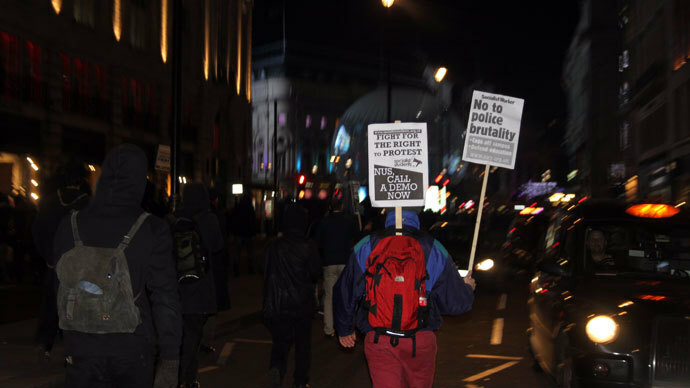 Other anti-privatization protests have taken place at universities across Britain. It’s no surprise why Britain’s students are more restive today that at any time since the late 1960s. Britain’s neoliberal elite has been treating them as it treats most people – with total contempt. Before the last election, Liberal Democrat leader, Nick Clegg, pledged not to increase tuition fees, but once in government he backed the lifting of the cap on tuition fees to £9,000, condemning students to even greater levels of debt. Last month the privatization-obsessed government sold part of the Student Loans book with a face value of £890m to a private investment consortium for just £160m. This was another example, hot on the heels of the Royal Mail sale, of the way the government short-changes the taxpayer to benefit private capital. If the government gets their way, then the entire British state – with the exception of the Armed forces and the judiciary – will be privatized. And they’re determined to use draconian measures to get their unpopular policies through. The authorities have made it clear what their response is going to be to students who have the temerity to stand up for their rights and the rights of others working in the education sector: aggressive police action, student suspensions and court orders banning protests. And they’ll be relying on elite commentators in the media to ‘do their job’ and either ignore the clampdowns or attack the students as an ‘unruly mob’, before writing their pieces extolling student protesters in other countries. This entry was posted on Sunday, December 22nd, 2013. You can follow any responses to this entry through the RSS 2.0 feed. You can skip to the end and leave a response.